This weekend is The North Face Endurance Challenge where I’ll be running my first ultramarathon, a 50K on the trails of Marin. 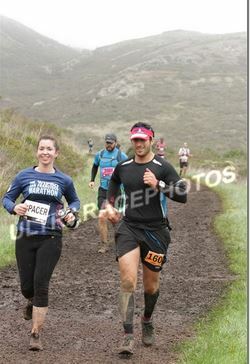 Last year, I paced Jesse for 25ish miles during his 50-miler amidst pouring rain and battered trails. The trails were so treacherous that the shorter distance races on Sunday were canceled. 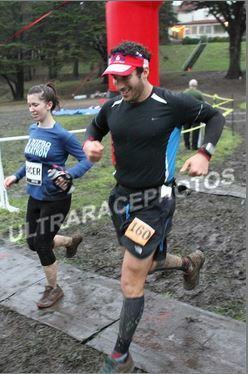 Crossing the finish line at last year’s muddy race. Carboload properly: I’m really bad at carboloading, according to Jesse. I eat too many vegetables and fiber and not enough simple carbs in the days leading up to race day. Despite my bringing a tofu, vegetable, and quinoa stir fry for lunch today, I will start eating more simple carbs for the sake of my glycogen levels. Eat early and eat often: Jesse gently scolded me during last year’s race for not eating early and often enough. He tells me if I’m thristy and hungry, it’s already too late. I intend on enthusiastically eating and drinking at every aid station. Stretch and foam roll: My muscles need to be loose on race day to ensure I can power up hills and recruit my larger muscle groups instead of relying on my calves. I will stretch and foam roll for an hour every night leading up to the race. Dress warmer: I’ve never raced on a day with a projected high of 48 degrees. I intend on eschewing my tank top for a long sleeve and will potentially bring more layers to ditch at drop off stations. Have fun: Saturday looks to be a beautiful day, and having ran the 50K a couple of years ago, Jesse says the views are spectacular. I don’t doubt this for a minute; Marin is one of my favorite places to run, with breathtaking views of the Golden Gate Bridge, San Francisco Bay, and the city skyline. 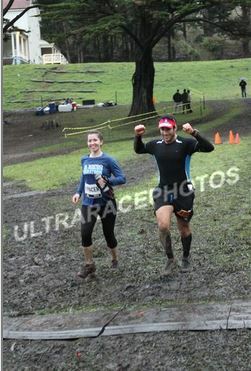 My number one goal for this race isn’t a time goal but instead to cross the finish line with a smile on my face. If I follow my own advice, the race will be a success. Good luck to you, I hope you have a great experience! And no rain this year, yes! That is amazing. I wish for you a smooth, happy run! Anything that distance is just flat out determination. Impressive. 🙂 Good Luck!